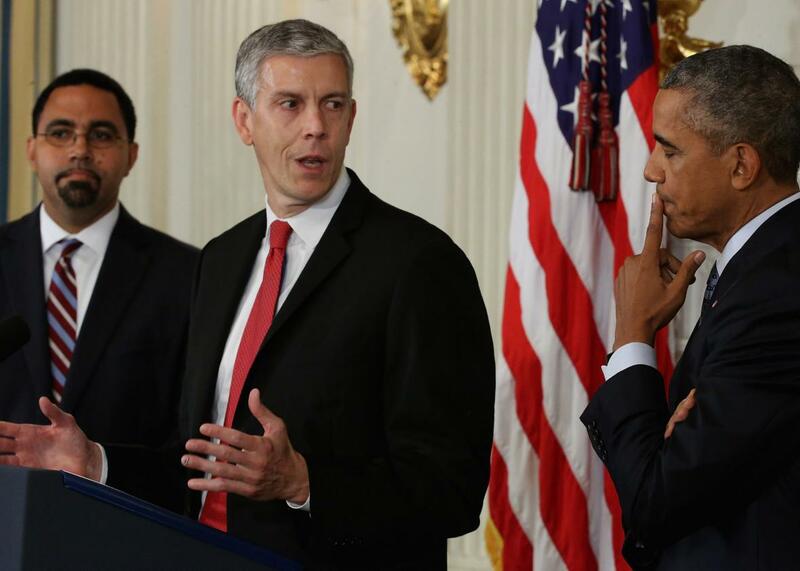 On Monday, President Barack Obama will meet with outgoing Education Secretary Arne Duncan (center) and incoming Education Secretary John B. King Jr. (left) to discuss standardized testing in schools. Between pre-K and 12th grade, the average American public-school student will take 112.3 tests, or roughly eight tests a year, according to a long-awaited report released Saturday by the Council of the Great City Schools. In eighth grade, sitting for mandatory tests—forget about all the prep and sample tests—takes up 4.2 days of school, or roughly 2.3 percent of the academic year. The two-year study looked at testing patterns in 66 of the country’s biggest school districts and found that many of these tests are redundant, misaligned with curriculum, and often completely disconnected from the “college and career”–ready skills they were putatively designed to measure. The study also found little correlation between time devoted to testing and any improvement in math or reading skills. You get the idea. Obama certainly isn’t spurning testing altogether; he concedes that “in moderation, smart strategic tests can help us measure our kids’ progress in school.” The problem—which it seems many, many parents and educators have repeatedly brought to his attention—is that we have lost that sense of moderation somewhere along the way. Ya think? On Monday, Obama, Education Secretary Arne Duncan, and Duncan’s soon-to-be successor John King will meet with teachers and school leaders in the Oval Office to discuss how exactly they’ll achieve these lofty goals. But will they address why they’re suddenly taking on these issues so close to the end of the administration, instead of, say, five years ago, when the brunt of the stringent testing requirements still fell on largely urban, impoverished communities? Could it have anything to do with the notably different demographics of the parents now demanding to be heard?